Data Explanation: Extrapolation requires treating the entire area within a combination class as a single sample unit rather than analyzing individual counties. Highly urban areas (Landscape Class A) are precluded from extrapolation due to high intraclass variation. Realistically, 10 years is too brief an interval to precisely estimate the chance of a relatively rare event. A more inclusive estimate of where these larger, longer-duration fires might occur in the future is obtained by extrapolating the 10-year sample to all combinations of resiliency classes and community clusters. 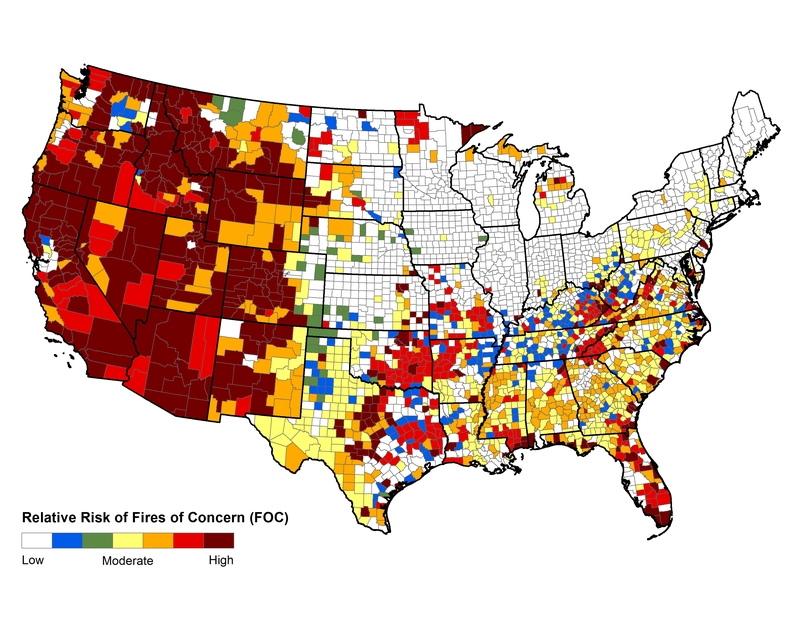 The resulting map indicates that much of the West, Southeast, and mid-Atlantic regions display areas of relatively higher probability for fires of concern, as well as scattered counties of the upper Midwest (Option 8, figure 3.16). In these areas, preparing for large, long-duration wildfires is presented as a national response opportunity and management option.